So, I decided to make my first character mod for SRB2Kart, and it's gonna be Bandana Waddle Dee from the Kirby series. I only have one sprite done right now as of the posting of this post. Here's a picture. The thing is, I don't really know much about modding this game so I may need some help along the way. And yes these sprites were edited off of the Kirby mod, I'll give credit to the creator of that mod when I release this. Ok, quick update, I finished a few more sprites. Now I want to figure out how to actually insert them into the file. MY GOD YES DO THIS PLEASE. And also, here are some links that may help you. About the frames and how are they organized and made. The Official Tutorial for Custom Characters. 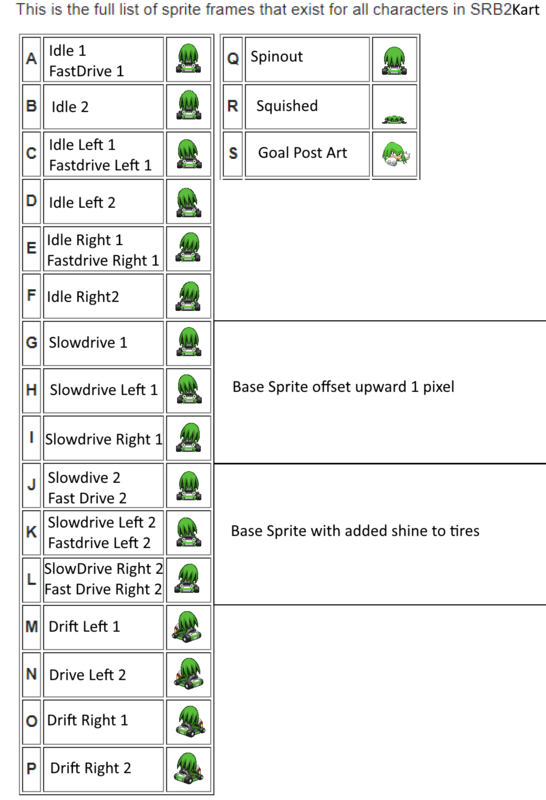 The differences when making a Kart WAD. A thread i made to clear up some questions, pretty basic but it helped me make my mod. I also recommend that you look at bonuschars.wad or other mods for reference, hope i helped and i'm so excited about Bandana Dee!, i'll be waiting!. Hm, do you know an easy way to make vibrate sprites? Look at basekart.png, it is explained there, it's a technique erasing each 2 pixels and offsetting upwards by one. Is there any easy way to select every two pixels? It's pretty time consuming to select them all one by one. Well in paint I do it with this tool, i use Paint XP to sprite by the way. My doG that's actually really heckin' useful, I have a lot to learn, need to put that on practice when making mods from now on, thanks!.